Lions of Belle Fourche: Northern Lights Lions are chartered! Northern Lights Lions are chartered! Some 100 Lions club members, spouses, and friends attended a Charter Banquet for the new Northern Hills Lions Club last Saturday night (1/23/10) at the Branding Iron in Belle Fourche. At right are the officers who were installed for the newly-formed Lions club. In the front row (left-to-right): Joyce Drabek, Linda McElwain, Joan Manke, Marsha Osloond, and Kelly Walton. 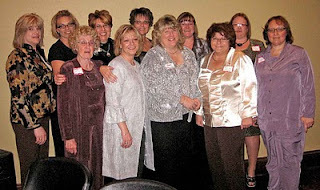 In the back row are: Mary Riley, Robin Carlson, Bev Banks, Kellie Pummel, Geri Drabek, and Dallas Connor. Mayor Dave Schneider was on hand to welcome the group, which gathered to recognize the newest Lions Club in the area, comprised of Belle Fourche area ladies. They've already created a nice-looking web site. You'll find it at www.northernlightslions.com. Lions District Governor Doug Sheller and his wife Donna attended the banquet, along with numerous Lions from other clubs around the region and across the state. Many of those clubs presented gifts to the fledgling club. Bob Drabek of Rapid City, a former international officer of Lions International, was keynote speaker for the evening. District Governor Scheller provided a brief history of Lions clubs and their emphasis upon service to others. He then presented the formal charter to Northern Lights President Bev Banks. Thanks to Lion Bill Kunerth for providing the photograph above. A larger version of this photo, along with other candid scenes from the Charter Banquet can be found in our Lions Gallery.